So I’ve been hearing a lot about this hidden gem and seeing it recommended in a couple of sites. Apparently it has been a go to spot for the locals (especially the love birds) and the tourists are just beginning to catch the wind. Next stop: Odaiba. As a first-timer there, Odaiba is relatively easy to get to. I suppose you could say that to most places in Japan! Anyway, it was a bright sunnny day so we decided to take the Yurikamome Line there. The view was mesmerising! I cannot stop taking pictures! I may have annoyed some of the commuters, but hey I’m a tourist. I would highly recommend catching the sunset here. The view is just breathtaking. And it was pretty quite when we were there, much quiter than Shibuya or Shinjuku area. 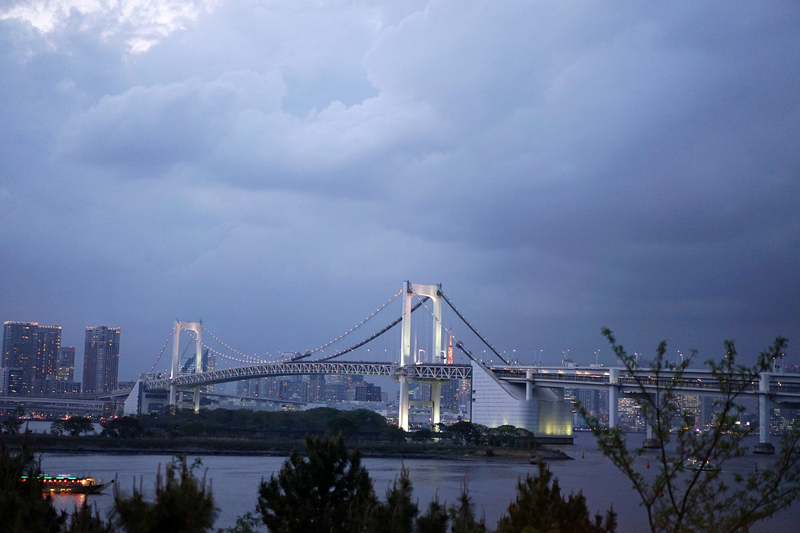 For me, the most attractive thing is the rainbow bridge. It looks so beautiful during the night! As the name suggest, it is shaped like rainbow! 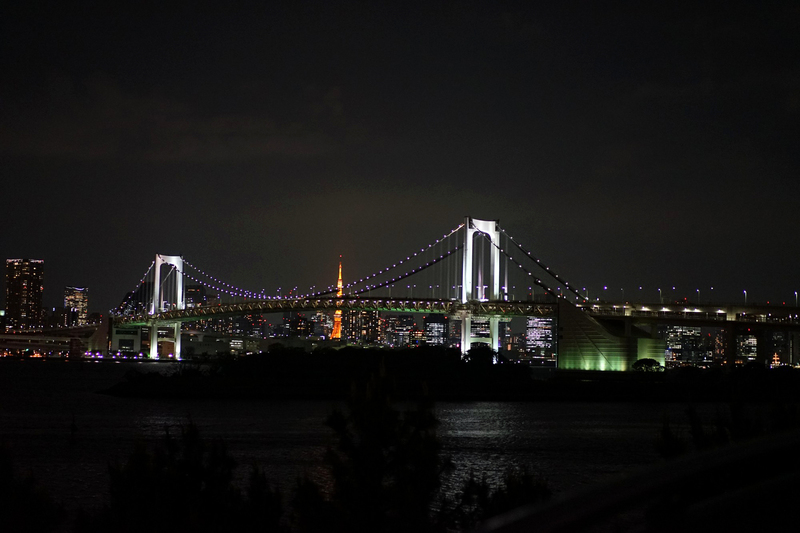 The bridge also light up from sunset until midnight and it changes colour! Today we start our pre-wedding video with Jimmy Indra from Axioo. I have seen his work in Instagram, but is truly amazed by seeing him in action real life. I am glad we came here. There are so many great shots and I’m having the biggest dilemma choosing the best one. As the sun sets, the weather turned for the worst. The wind blew hard and cold. I literally could freeze to death! We still had one more shot left, and keeping a straight face during the video was proving very difficult. To keep us warm, we decided to dance like our pants is on fire. I think there’s a video of us dancing stupidly. It did the trick for a few minutes, but the cold catches back to us. Before heading back, we wanted to get some hot coffee from vending machine to warm us up. None of us can read Japanese so Kalvin decided to press the one that looked like hot coffee. It turns out to be ice coffee! Being a stubborn that he is, he did it twice! Simple tips from me, red sign means hot and blue sign means cold, pay attention to it and don’t end up with 2 cans of cold coffee in a very cold night like we did. Xox.